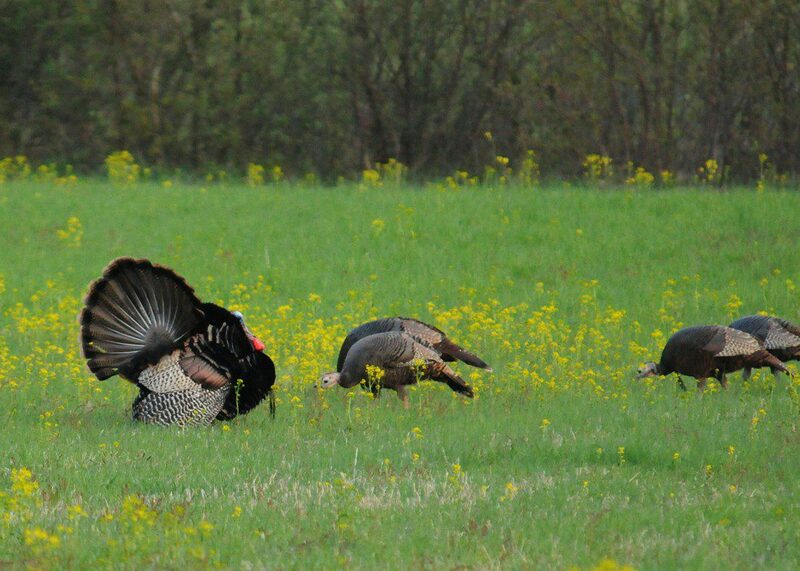 Wild Turkeys brighten up the landscape with their unique pattern of colors for both display and camouflage. Image by Derek Stoner. Today is the most bird-centric of all our holidays. Americans have carved out an entire dedicated to the consumption of one key food item: turkey. These domestic birds do not bear much resemblance to their wild cousins, but are still descended from the same stock that the original Pilgrims and Native Americans feasted upon together. Here in Delaware, the Wild Turkey population is estimated at around 5,000 birds. We do not have many turkeys in northern Delaware, but they may be found in isolated pockets across southern Delaware. Beautiful, showy, and cunning, the Wild Turkey is a symbol of the American Wilderness. Ben Franklin famously pushed for the turkey to be named the official symbol of our nation, but the Bald Eagle won that honor. So we have Ben to thank for the fact that we are eating delicious turkey today and not eating fishy-tasting eagles! HAPPY THANKSGIVING! We are thankful to all of the members of Delaware Nature Society, and appreciate all your support of The Nature of Delaware blog. Enjoy the holiday season. What organization is responsible for the restoration of Wild Turkey populations in Delaware during the past two decades? Please write your answer in the “Comments” section. The first person to post the correct answer will receive a copy of “Identify Yourself: The 50 Most Common Identification Challenges” — a most helpful and insightful book about birds.